One from the vaults. To enjoy good food, one must not only know where to eat, but also where not to eat. While I don’t generally focus on negative reviews, sometimes they need to be brought out into daylight. Singapore is a place where you can eat quite well for $3 (street food) or $300 (high-end fine-dining), but something that goes unmentioned is that you can’t really eat well for $30. Mid-range dining in Singapore is non-existent – places like Lolla and 2am:dessertbar, supposedly representative of a hundred flowers blooming on the Singapore dining scene, have virtues much exaggerated. The number of people who write knowledgeably about food in Singapore can be counted on one hand, making separating the wheat from the chaff of Singaporean food hard – one either relies on someone whose taste is impeccable, or one tries it oneself. The Singaporean food scene is undergoing its “sucker” phase now. Celebrity chef restaurants (Bruno Menard, Daniel Boulud, Jamie Oliver), hyped up tapas places (Lolla), hyped up concepts (2am:dessertbar), this Wild West of mid-range dining is designed more to part fools from their money than to feed them well. It would be a sad day when Singapore ends up with a restaurant scene like Los Angeles, which is based more on hype than on actual quality. But with an undiscerning consumer base, it is hard to see when the “Sucker Scene” will gradually change into a truly dynamic restaurant scene, like New York. 2am:dessertbar is bad. It relies on hype to charge extortionate prices, and represents the worst of contemporary cooking, using ultra-modern techniques without understanding the basic principles behind dishes. I’ve heard that 2am:dessertbar’s sous-chef was unable to distinguish between a souffle and a cake. With chefs like that, I think I’ll just go home and make my own desserts, thank you very much. In Singapore, there is still a space for a real dessert restaurant – something that would serve desserts on the level of l’Arpege, birch, or RyuGin. I still look forward very much to trying that restaurant in the near future. 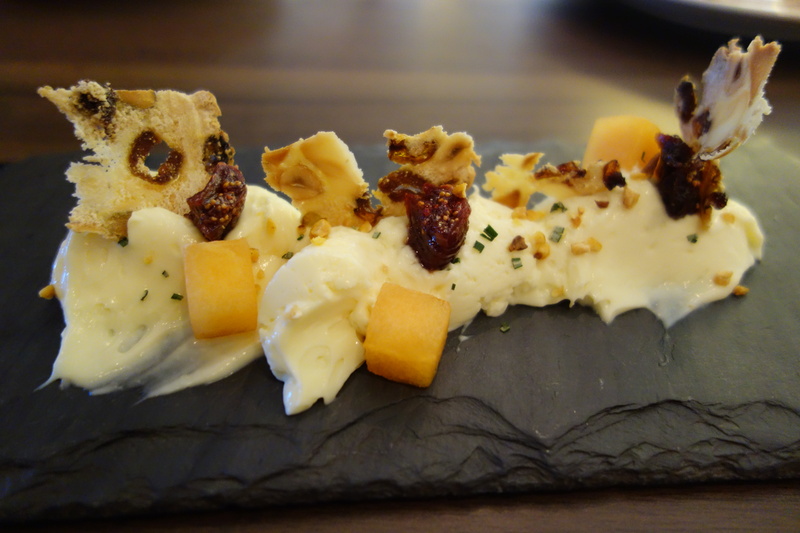 Cheese with nuts. No value add. Cheese was not of the highest quality, and bland. 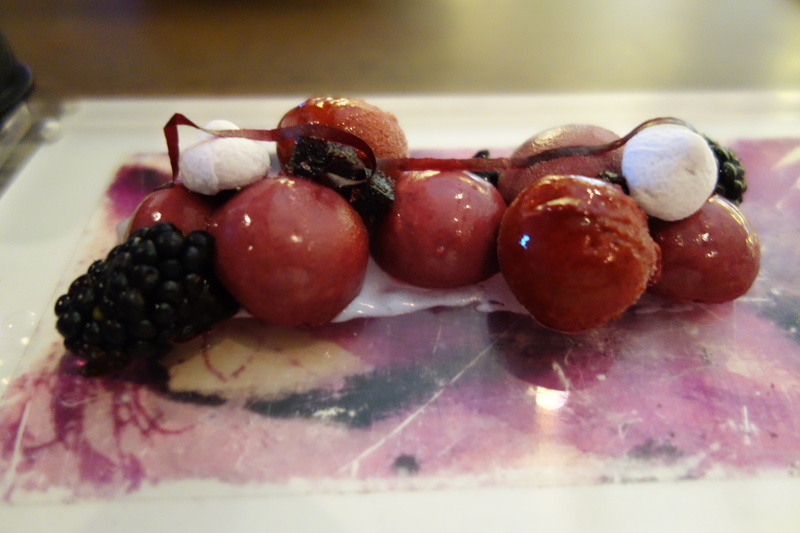 Purple potato puree was strangely tasteless, and made a jarring taste contrast with fruits of the forest sorbet. There was no reason to put purple potato puree in, other than its colour. 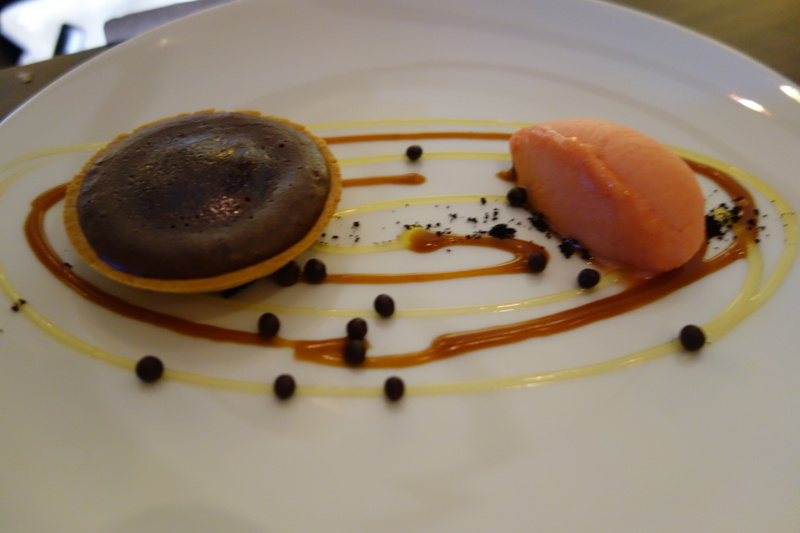 It added nothing tastewise, and added nothing visually – because everything was already purple, and the potato puree was visually undistinguishable from the sorbet. The only decent dish of the night.